The Slavs are coming to the Twin Cities of Minneapolis/St. Paul, Minnesota! 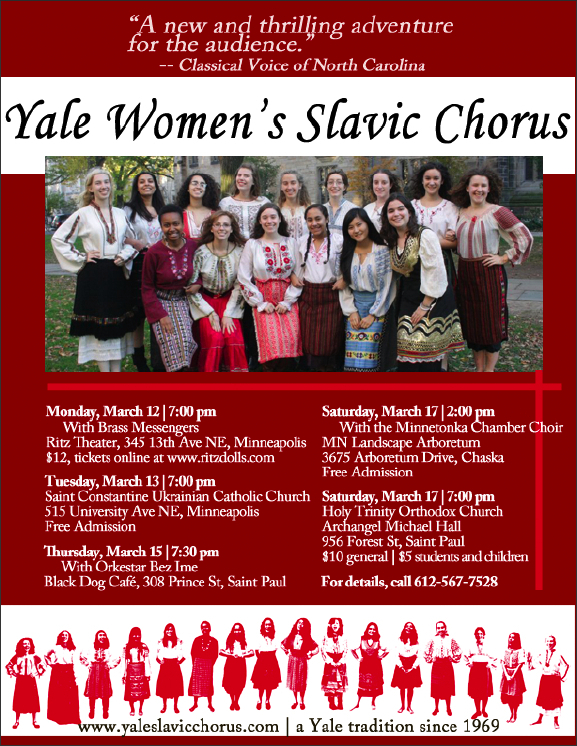 Presenting five public concerts around the cities in the week of March 11-17, the Slavs are excited to celebrate Minnesota’s vibrant Slavic heritage. Concerts will feature collaborations with some of the Twin Cities most exciting Slavic and non-Slavic music ensembles: the Brass Messengers, the Minnetonka Chamber Choir, and Orkestar Bez Ime. Get in touch with us if you are in the area, and buy your plane tickets now so you can catch these exciting events.